A hobo stove is a style of improvised heat-producing and cooking device frequently used by hobos, tramps, the homeless, and backpackers. It is constructed out of a discarded Tin can of any size by removing the top of the can, punching a number of holes near the upper edge, and punching corresponding holes in the opposite base. 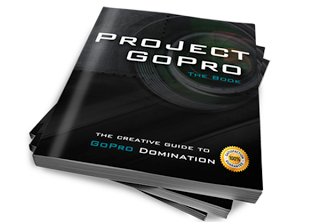 Fuel is placed in the can and ignited. 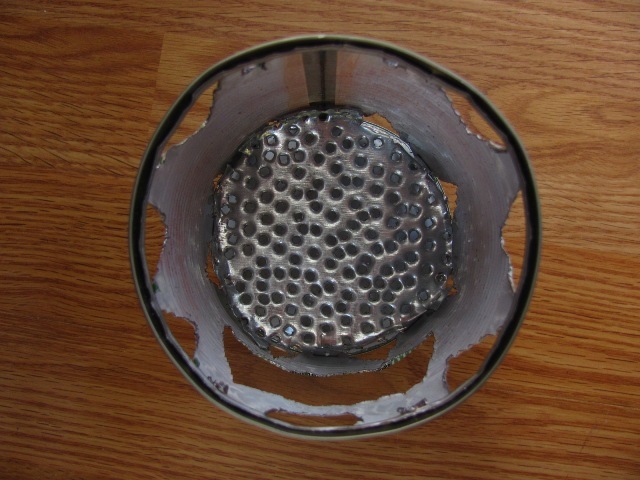 Convection draws air in through the bottom orifices and expels smoke from the top holes. 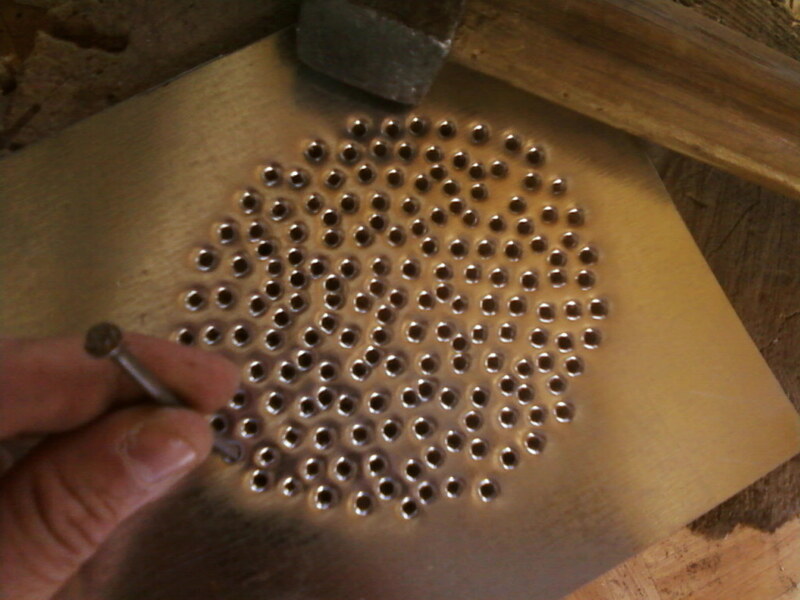 Improved heating is encouraged by placing the bottom holes facing the wind. Food preparation is often performed on the top of the stove on a cooking surface that also acts as a lid, however many variations exist where cooking is performed on the inverted base of the can. 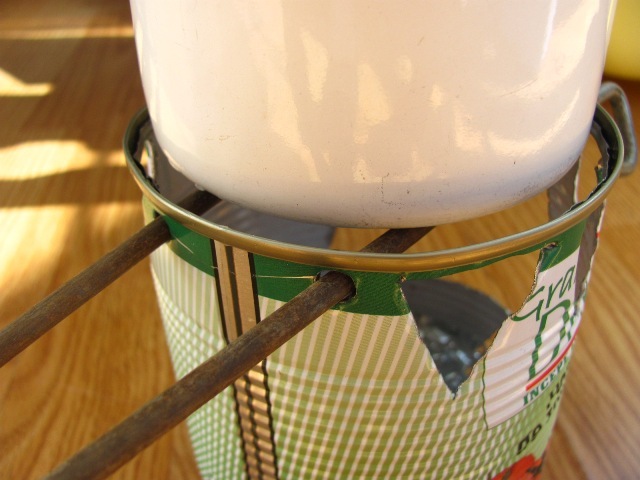 The main benefit of the hobo stove is its ease of construction and versatility. 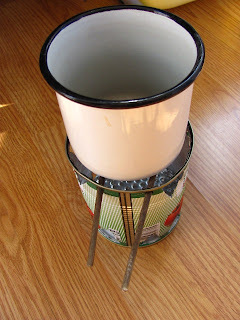 The stove itself can be constructed out of a variety of materials; paint cans, food tins, buckets, and large drums being most often put to that purpose. 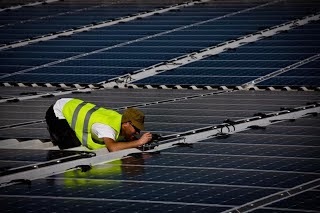 Further flexibility lies in the fact that anything combustible can be used as a fuel source. 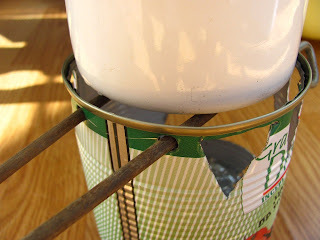 The hobo stove is able to use many fuels but most common is either dry twigs or a Buddy Burner which allows burning of liquid fuels like melted wax or kerosene. The hobo stove reached the height of its popularity during America's Great Depression. It's ironic that the hobo stove was popular during the Great Depression and I've come across it not a long time ago - when the world is passing through another great economic depression (it seems that we're all depressed or something). People get ingenious when times are hard and the hobo cooker is an expression of ingenuity and resourcefulness. 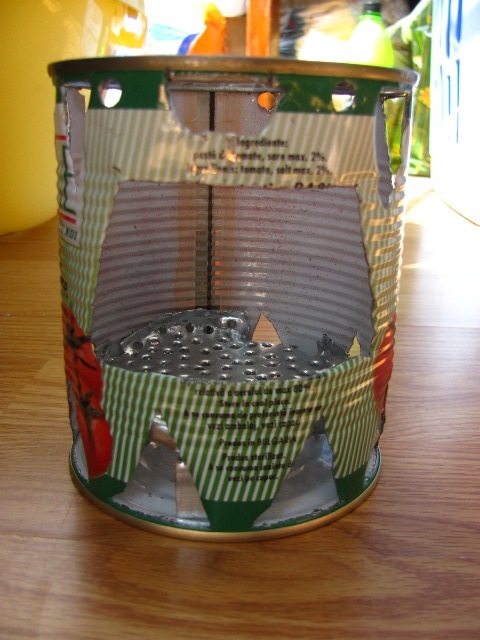 Why To Make Your Own Hobo Stove? It's cheap. You can make it more or less sophisticated but the main advantage is you can use whatever you have. And you're bound to have in your household at least an empty tin can. You can also use a paint metal box, a bucket, a broken vacuum flask - you name it. I recommend the tin can as it's the cheapest to get and the metal it's made of is easy to cut with a normal kitchen knife. 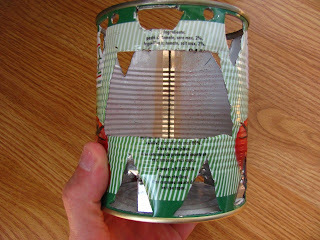 Buy yourself a can of sliced pineapple, enjoy the sweetness and use the tin for your hobo stove project. Fuel efficiency. The hobo stove allows you to boil water or cook your meal when outdoor camping with very little fuel. 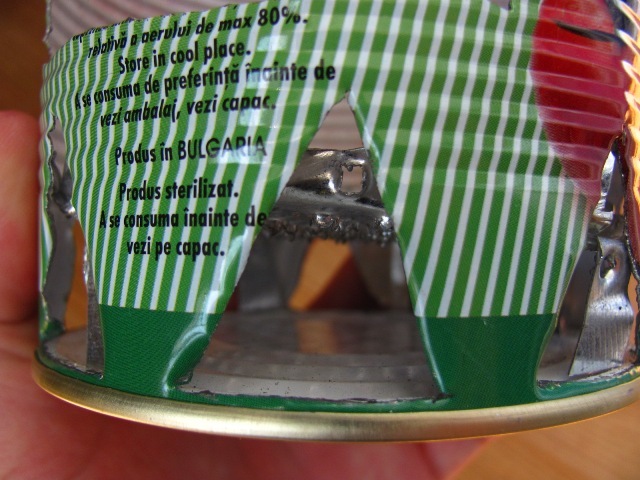 This is because both the smoke (which is hot) and flame are directed to your pot or metal cup. 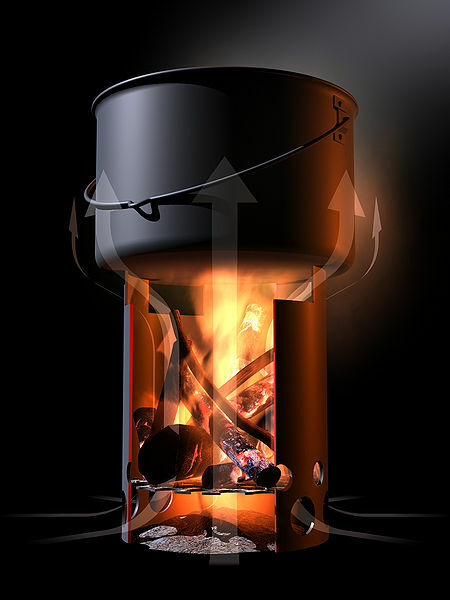 No energy is lost in the process due to the construction of the system - it acts as a fire gun as the airflow enters the bottom of the stove and fuels the burning flame, pushing it upwards. It's easy to set up. Let's say you're outdoors and want to spend the night outside in a bivouac and you also wanna prepare your meal. You would have to build a fire and then figure out a system for hanging your pot above the fire. If you make your suspended arm out of wood it might catch flame and burn before your meal is ready. 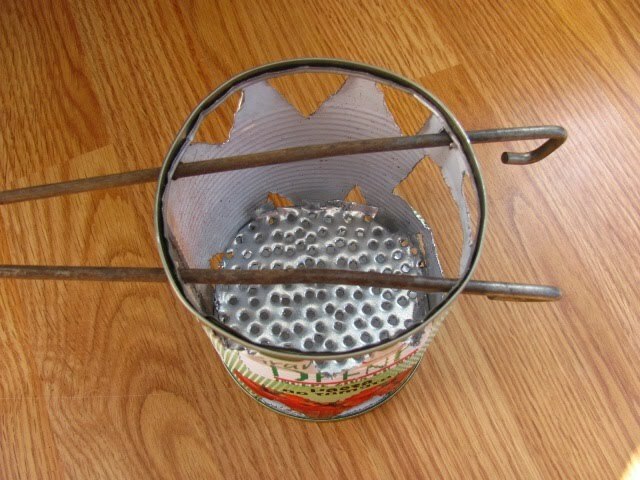 The hobo stove saves you the head ache. Light a small fire inside your can and you're done. Just place to pot on top and you're cooking already. Works with any fuel. Even if you can only find dried grass, or dried leaves or dead reed you can still boil your water on the hobo cooker. As long as you feed it with fuel it will get the job done. I will carry it in my outdoor adventures from now on as an alternative to the costly gas bottles for the camping stove. I love the cleanliness of cooking with gas but some old school gadget won't do me any harm. And since I love making fire so much, this will be my new toy to play with :-). 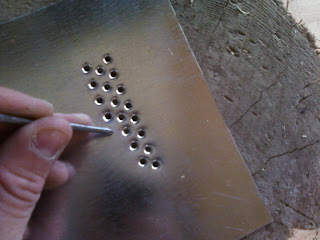 Get yourself a tin can and cut a row of holes at the bottom and another row at the top, just under the lip of the can. I recommend to cut triangle shapes as you can see in the pictures below. Have the bottom triangles with the tip pointing upwards and the top triangles with the tip pointing downwards. Make a front large hole for feeding fuel into your hobo stove. 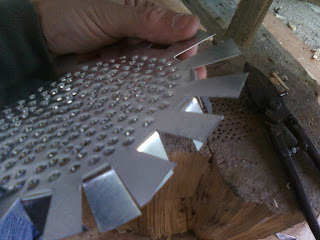 Make it large enough as to be able to put through small pieces of wood, pine cones, etc. However, when you light the fire you are more likely to feed the fuel from the top and only add sticks through the front hole after the pot is on the stove, later on when the fire has traction. Think about making a grate for the fire to rest on. A hobo stove might work without it as well but the grate will enhance the burning and will provide better ventilation, bringing oxygen to the flame and giving the proper uplift for the flame to hit your pot in full power. 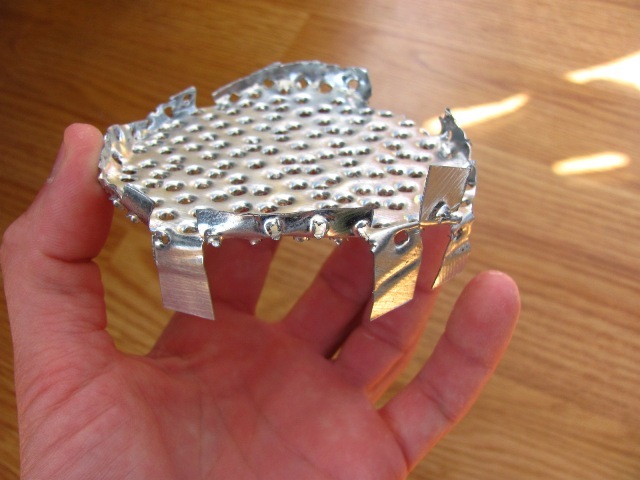 You can make the grate out of any sheet of metal. 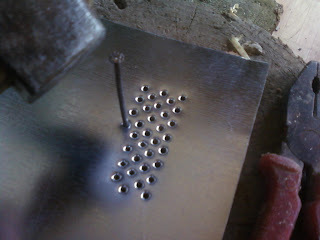 I used a piece of zinc sheet (used in roofing) that I punctured with a nail and then cut it with a special scissor (my father has these tools for his construction work). 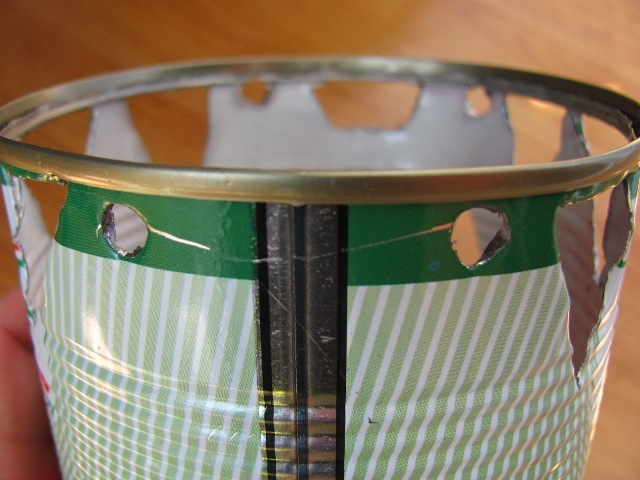 If you can't find a zinc sheet, use another tin can for this - cut the top and the bottom lid, cut the cylinder along it's seam (height), roll it flat and then puncture it. Cut it in a disc shape and leave four legs on which it will rest (suspended) on the bottom of your hobo stove. The ashes will pass through the grate leaving the fuel un-smothered to burn effectively. 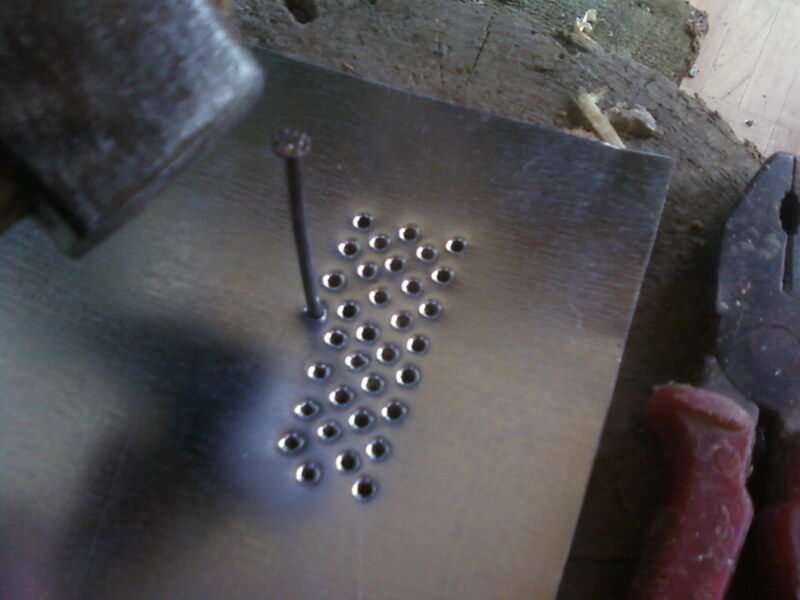 Drill or puncture four holes for passing through two tent pegs. The pegs will hold any narrower cup you may carry with you while mountaineering or adventuring in the wild. 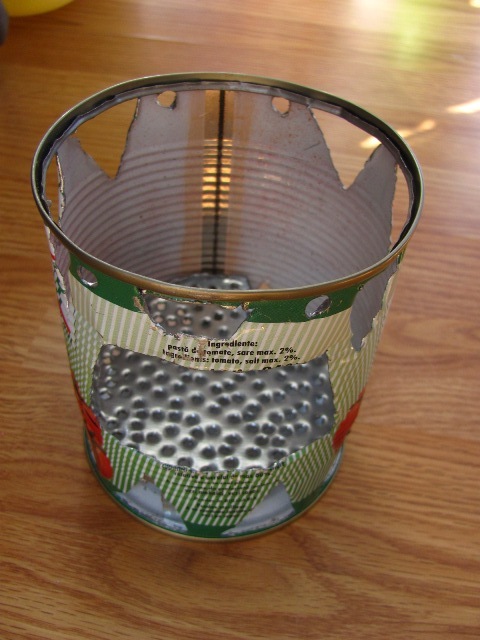 Please note that you can also build an alcohol hobo stove which works on the same principle but uses alcohol as fuel. 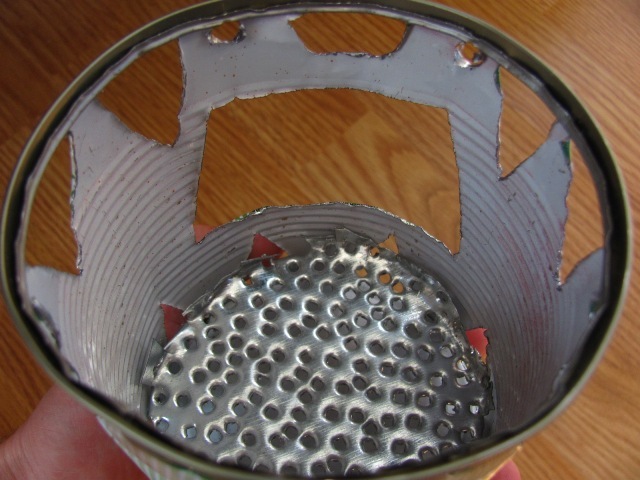 The alcohol burns in a smaller metal cup (can be made of a beer can) which is placed inside the larger tin can. Hybrid hobo stove made by Brant Dempster (The Limb Reaper on YouTube) - a friend and rope access master from Pennsylvania - USA. Wanna make a hobo stove? Buy Hobo Tomato Sauce, use the can as a stove and enjoy your pasta with this wonderful sauce made from specially selected tomatoes. 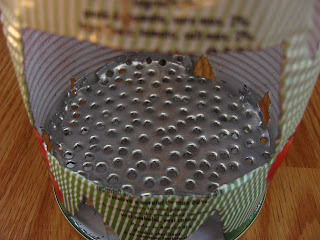 Disclaimer: Making a hobo stove may lead to injury or sneezing. Don't eat too much pasta or you'll get fat even though you may think of yourself as big boned. Some pictures were taken by phone. Please excuse the questionable quality. Go outdoors and prepare your meals on your hobo stove! Thanks Richard! I must shoot a video with the hobo stove indeed. I'll embed it here later. 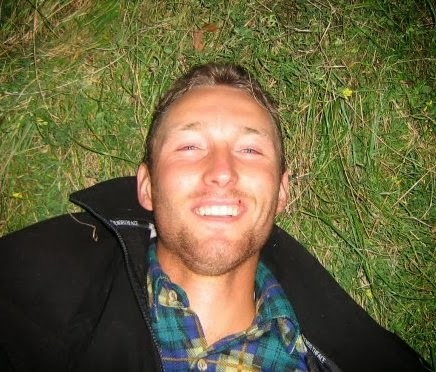 Hey Constantin, where do I get Hobo brand tomatoes from? I love the humor! 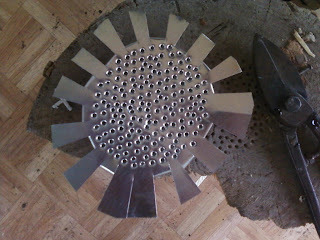 Your stove looks great and is made in the true spirit of the Hobo stove. 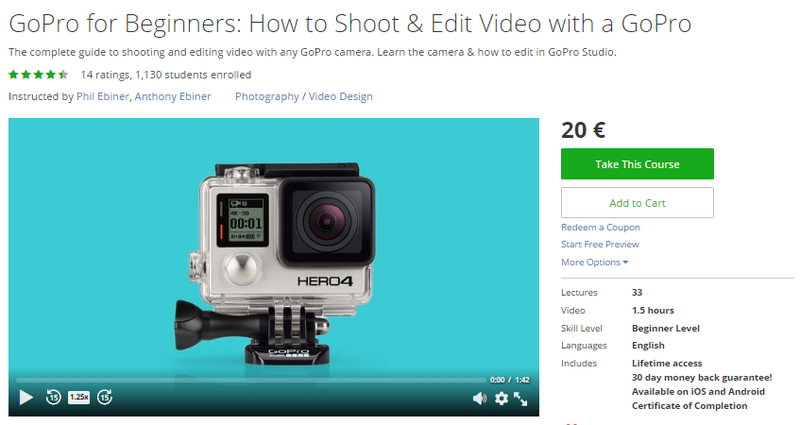 There I was reading the description intently, scrolling down and low and behold "There I am". I owe you "big time"! I'll have to clean the shed/workshop before I do another video. It had me "cracking". That's great and I like it! No need to clean that shed unless you want to. I love authenticity! I'll test the hobo cooker and shoot a video with it in the following days. I'll have my dinner outside - broth.